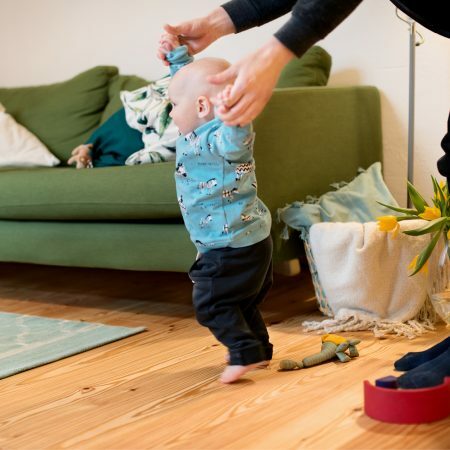 Little Julius crawls with excitement and wide eyes across the new living room floor. 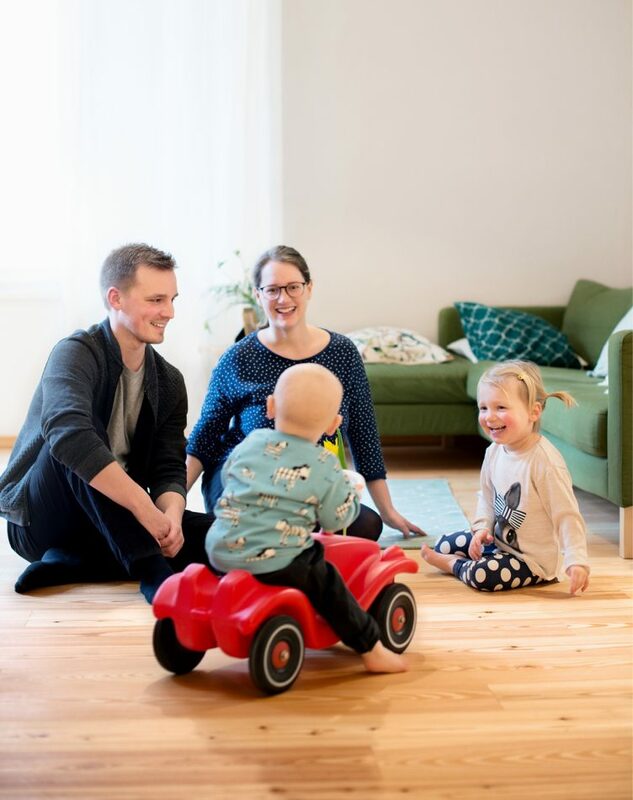 His three-year old sister drives past him in her Bobby Car missing him by a whisker, but the parents, Gloria and Tim L., have everything under control. 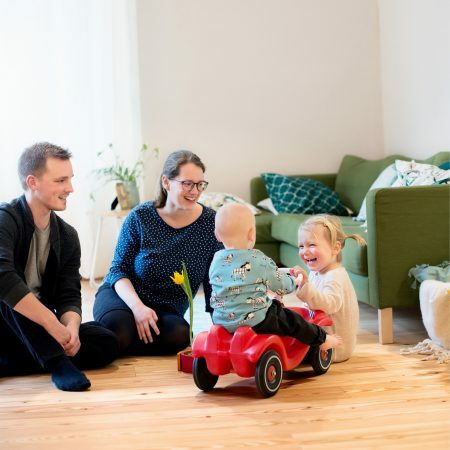 “Originally that used to be Gloria’s (26, student) shared apartment, now it has turned into our living room,” explains Tim (26, student). 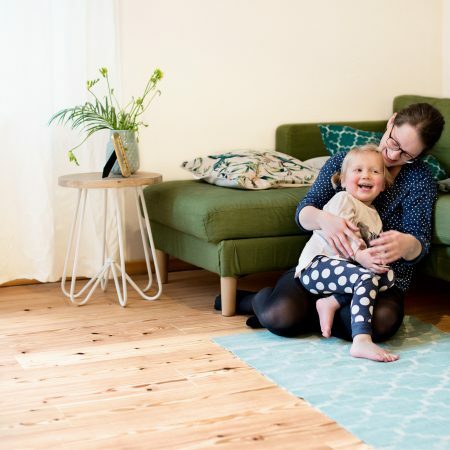 But the flooring was in a very poor condition: the old, broken laminate flooring was uneven in many places, sharp pieces of wood could be pulled out of it and children’s feet could easily pick up a splinter. 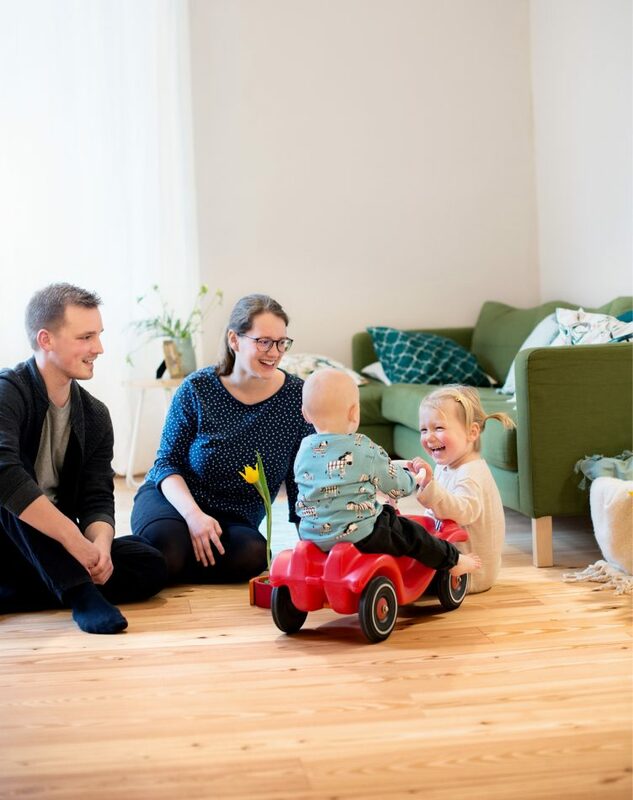 Parador helped the young family as part of the “40 years, 40 projects” campaign with the light-coloured and sturdy engineered wood flooring larch wide plank for their living room and the baby-changing room. 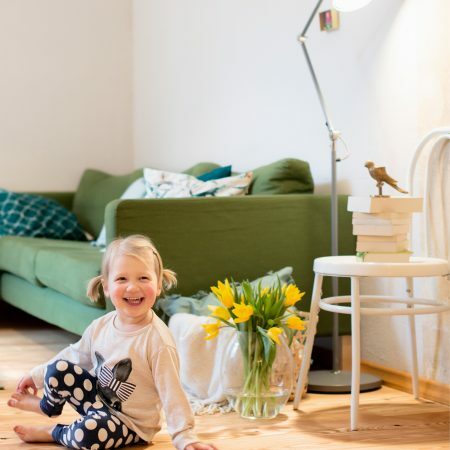 This made family life much easier for the young parents from Berlin-Kreuzberg. 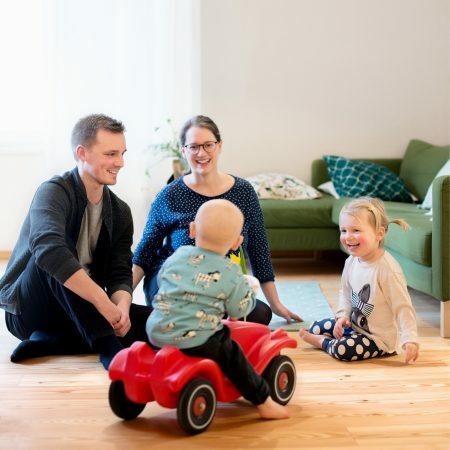 Tim is studying architecture and works alongside his studies at an architectural firm, whilst Gloria has taken a break from her studies to look after the children for the time being. 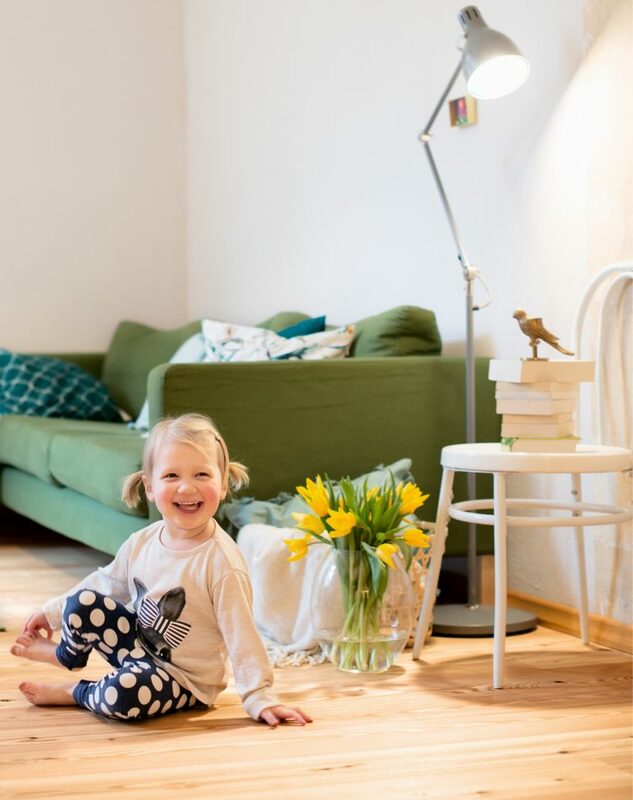 And they can really run the parents off their feet: the apartment comes to life from 5 in the morning. 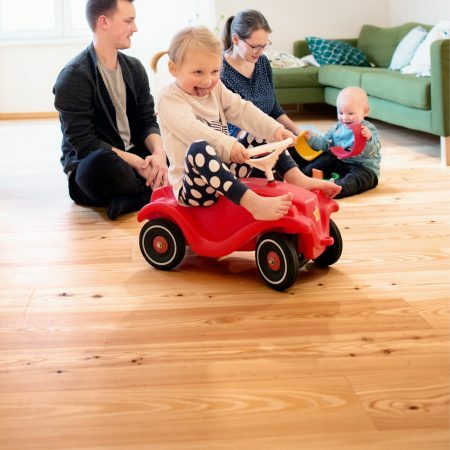 The new flooring from Parador now gives the family a modern focal point to play, romp around, hide, do gymnastics, drive, dance, sing, creep, relax, walk, learn – to live. 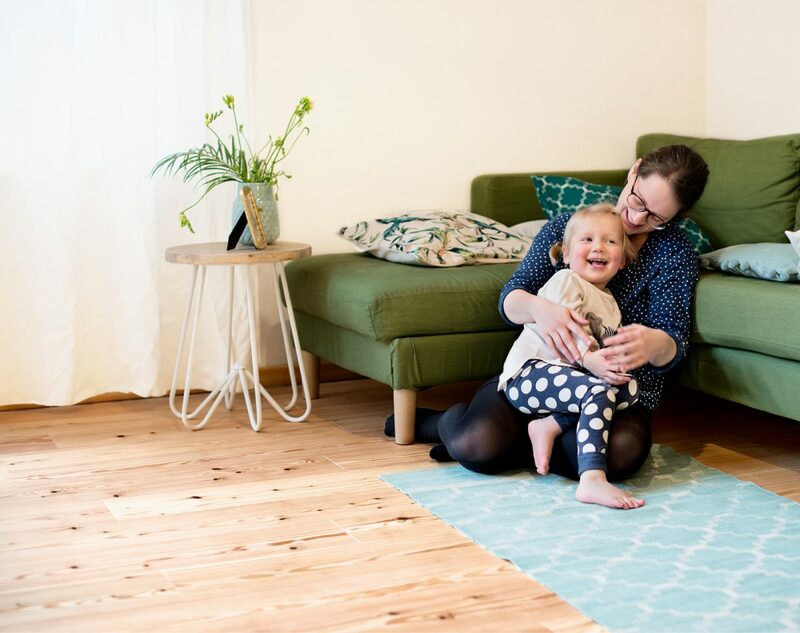 The durable Parador flooring is also equal to the demands of lively families. 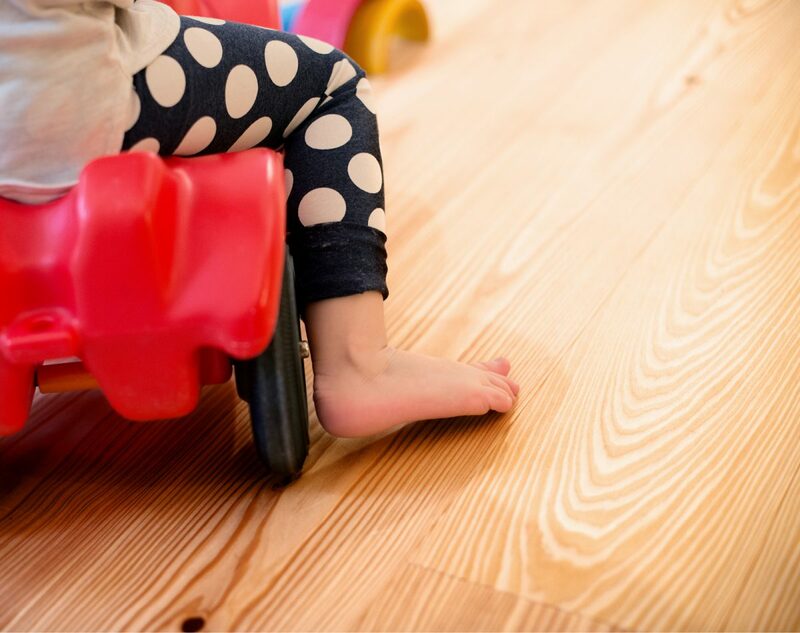 For our floors we are using exclusively natural materials that meet our highest quality demands. 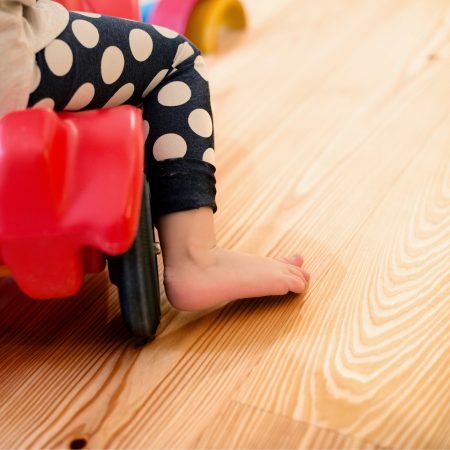 The new, light engineered wood flooring turns the living room into a play room. 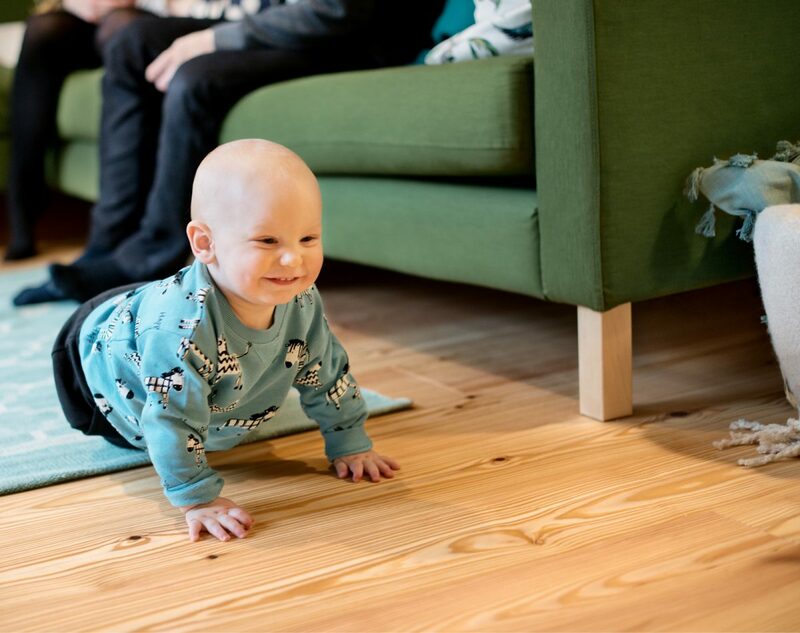 Julius (1) can now practise his first steps on an anti-static, flexible floor. The environmental sustainability and high quality standards of our products are tested and certified by independent institutes. 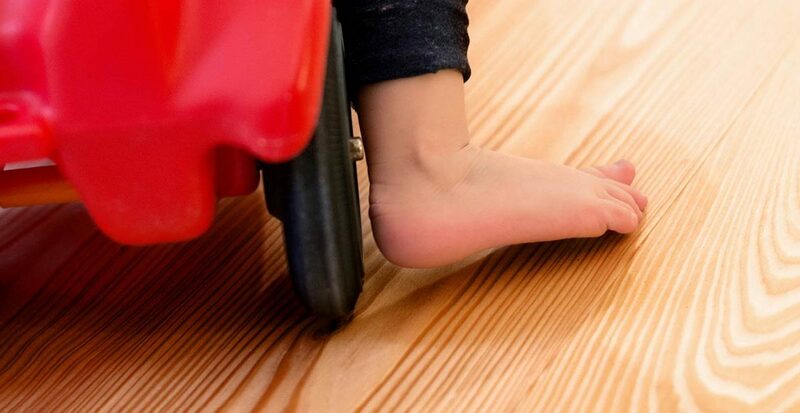 The all-round edge impregnation offers protection - so the flooring can easily cope with the odd accident. 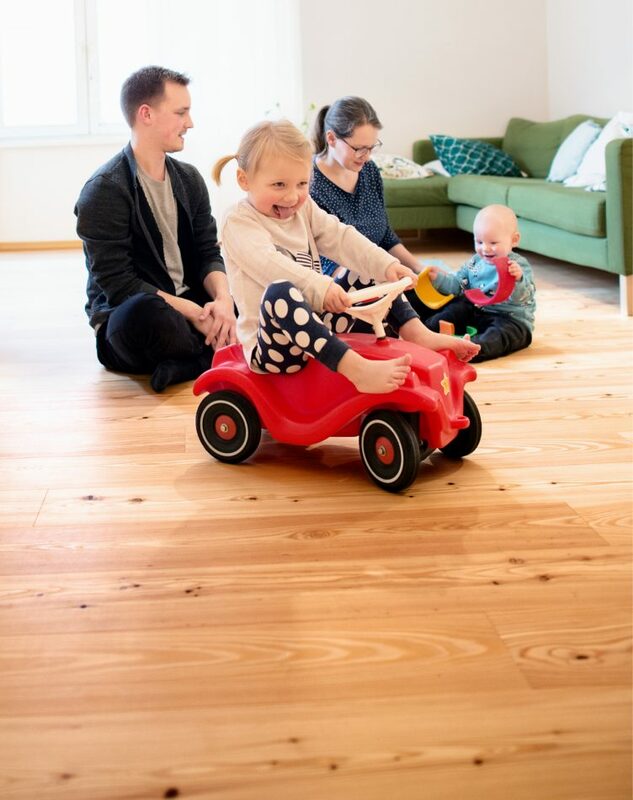 The engineered wood flooring, larch wide plank Classic 3060, withstands even excessive strains - we give a 25-year quality guarantee for that. 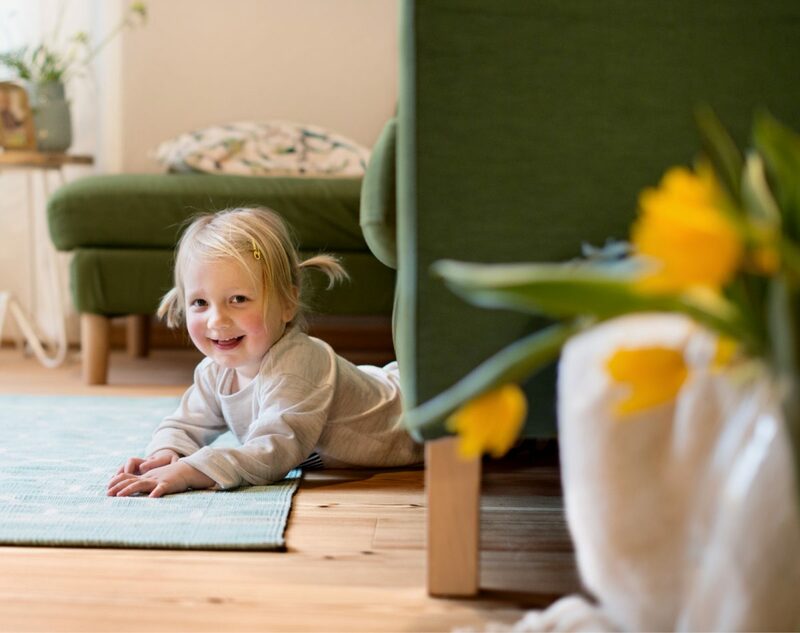 Suitable for underfloor heating for a healthy indoor climate and minimal heating costs. We observe highest ecological and quality standards - for high-quality products. 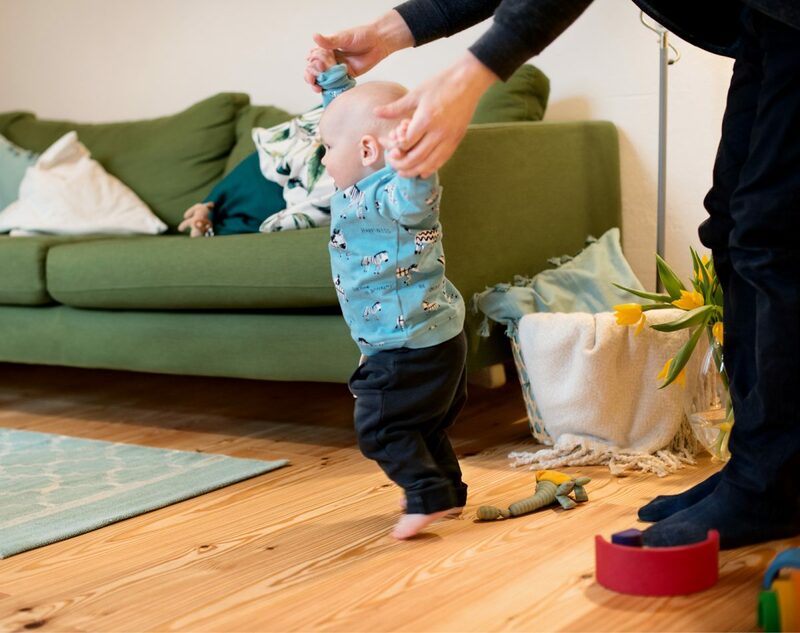 A floor for playing, romping around, hopping, laughing, crawling, running, learning, dancing – for living. We are using exclusively wood from sustainable forest management and actively support reforestation. We focus on sustainability - that is why we combine nature conservation with social projects.